Israel, said Netanyahu, “faces many enormous challenges, some of them unprecedented. I wish to point out that the threats from Iran, Syria, and Hizbullah are constant and ceaseless. In order to respond properly to these threats we need a government that is as large and diverse as possible that will unify the nation. “With that, we are obligated to do everything possible to advance the peace process,” Netanyahu continued. Besides being Justice Minister, Livni “will be a senior partner in the efforts to restart negotiations with the Palestinians, with the aim of achieving a just peace between our two nations. We will achieve this under the aegis of my 2009 Bar Ilan University speech. We will establish a ministerial committee that will deal with the peace process based on the principles I have laid down. I will authorize Livni to negotiate with the Palestinians. Netanyahu called on other parties to join his coalition. “This is not the time to harden your positions,” he said. 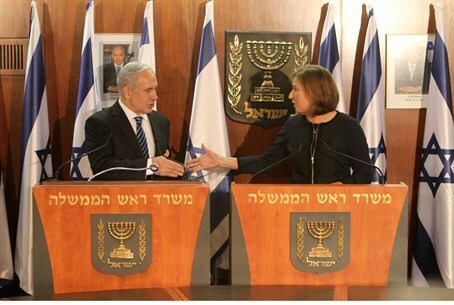 Livni said that she had been conducting “quiet talks” with Netanyahu and the Likud/Yisrael Beiteinu. As part of the agreement shew will be a member of the security cabinet, and will work with the Prime Minister, Defense Minister, and Foreign Minister on achieving an agreement with the Palestinians.